On 12th May 1927 HILLS Patents Ltd was founded in London by Kenneth John Garle and started making number plates from metal plates embossed with letters. Garle’s entrepreneurial spirit was troubled by the time taken to make each plate and in his search for efficiency developed Flexwyt letters, white plastic letters that fit on top of the plate, and these were launched in 1948. Hills grew steadily and attracted the attention of Plantation Holdings who bought Hills in 1958. Despite the change of ownership innovation continued and retro-reflective plates were introduced to the UK market. 3M took control of Hills to support their reflective material product. The market moved on and 1975 saw the introduction of acrylic number plates that eventually replaced metal plates. The constant theme of innovation saw Hills commission the first oil based ink production lines in 1983, speeding up production and offering a more durable number plate. Hills was sold to Brakeco. The next step in printing innovation came in the early nineties when Hills commissioned the first off-set litho printers with UV ink for logo production on number plates, another industry first for the business. This introduction coincided with Hills first international foray into the French market. Digital thermal print for in-house production followed closely by the development of dead-size material to enable no trim lamination was implemented in 1994. Technological developments empowered Hills to grow the business and Holman Number Plates Limited was acquired. The mid-nineties was a very busy period for Hills when they consolidated all of its UK sites to Birmingham. 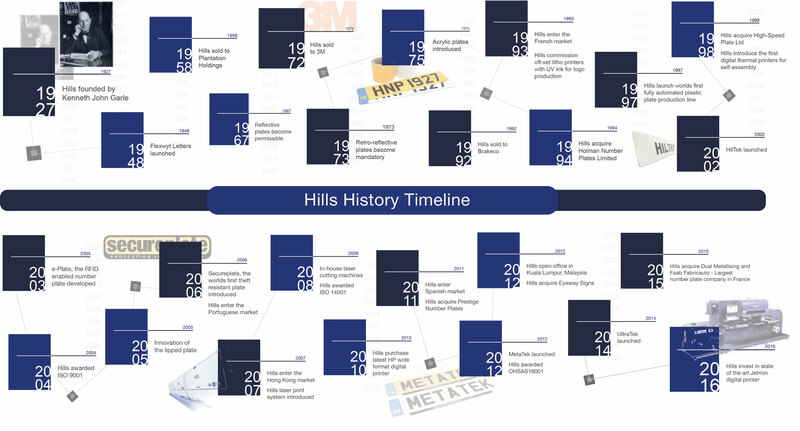 Growth meant further technological development, in 1997 Hills owned the world’s first fully automated plastic plate production line, which remains the only one of its type in the UK and is still in use today. Hills acquired Hi-Speed Plates Ltd, expanding the business competencies. Hills developed and introduced the first digital thermal printers for self-assembly allowing consumers to buy component parts and digitally print plates on site. The new century brought developments in both Hills and the industry. A new British Standard for number plates was introduced, BSAU 145d, which saw major changes to the market. Hills management also concluded a management buyout in the same year and the team was quick to market with their new patented product, HilTek. The tide of innovation didn’t stop there, in 2003 the world’s first RFID enabled number plate, e-Plate, was developed and launched. Hills processes were recognised in 2004 with the award of ISO9001:2008 QMS. With a focus on building a varied product range Hills implemented innovation of the lipped plate. Hills introduced Secure Plate, the world’s first theft resistant plate. Hills also expanded its European portfolio with entry into the Portuguese market. Continuing their innovation strategy, Hills introduced laser printing technology. Hills entered the Hong Kong market to expand the business overseas. Hills commissioned the first of 5 in-house laser cutting machines for material conversion in 2008. ISO14001:2004 EMS was awarded, recognising Hills manufacturing commitment to environmentally friendly practices. Hills also commissioned the world’s largest HP wide-format digital printer to satisfy growing international demand. In a prominent position to cater for international demand Hills entered the Spanish market. The best technological advancements meant Hills were able to grow the domestic market further with the acquisition of Prestige Number Plates. Hills response to climate change and extremes of temperature resulted in the development and launch of their patented product, MetaTek. This year also saw Hills awarded yet another accreditation in the form of OHSAS18001:2007 OHSMS, demonstrating a commitment to health and safety, making Hills the only company in the market to hold all three accreditations at that time. Hills entered the Malaysian market with the opening of their latest subsidiary Hills Numberplates (Maylasia) Sdn Bhd located in Kuala Lumpur. With the ambition to diversify the business and enter new markets Hills acquired Eyeway Signs, a health care signage manufacturer. Not forgetting the number plate market and expanding the product portfolio Hills launched the premium number plate, UltraTek. Handmade for the car enthusiast with raised black characters to give the number plate a unique appearance. The success of Eyeway Signs gave Hills confidence to enter a new type of market with the acquisition of Dual Metallising Limited, a manufacturing business that produce finished products for the automotive, brewery and retail markets, specialising in vacuum metallising. Focusing on the global market Hills purchased Faab Fabricauto, the largest French number plate supplier, from 3M positioning Hills as the number one supplier of registration plates in Europe. Investment in state of the art Jetrion digital printer changed production entirely enabling Hills to further progress in lean manufacturing. The acquisition of J R Wald Company, a number plate manufacturer based in Huntingdon, Pennsylvania, USA, placed Hills as the third largest licence plate supplier in the world.